Hello 2016! 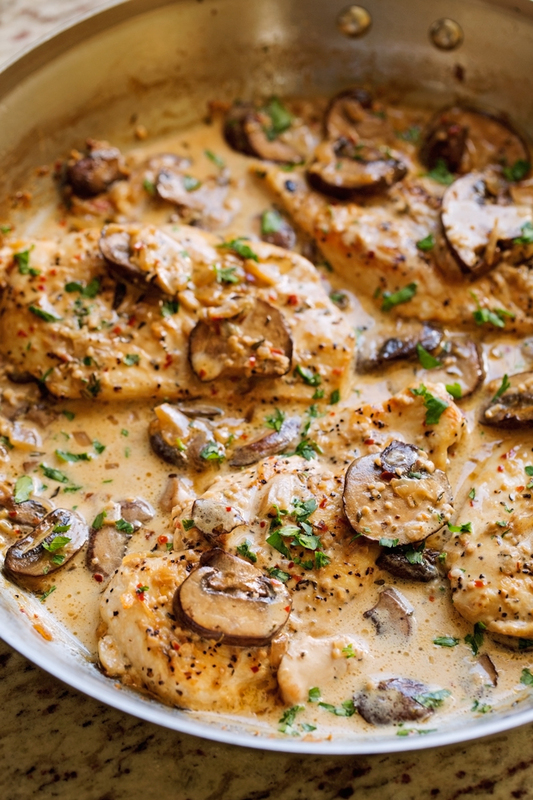 I am making this one skillet chicken dinner smothered in garlic and mushroom cream sauce on repeat this year. This is the latest addition to my one skillet chicken dinner family. We need more 30 minute meals that are easy to pull together on a weeknight. Enter this chicken dinner with veggies and sauce built right into 1 pan. A new year definitely called for a new spin on the recipe. We’re using the same basic ingredients, minus the lemon juice, add the mushrooms. Can you tell my new years resolution has something to do with eating more veggies when the first post of 2016 is my favorite recipe from 2015 revamped with veggies? Is it obvious? You guys, we’re barely 4 days into the new year and it’s been a roller coaster already! Not that i’m complaining or anything. And what’s that saying about the first week of the new year being crazy busy means your whole year is probably going to be the same way? Oh there’s no saying? Well, i’m ready to assume this year it going to be Legend—wait for it— dary. Yes, i’ve officially binge watched 6 seasons of How I Met Your Mother, thankyouverymuch. So this weekend, we FINALLY did some decorating around the house. The gallery wall is up. It took me a month to gather the strength. I’m crazy meticulous when it comes to wall hangings. If it’s crooked it drives me nuts. Forever. I’ll stare at it’s imperfections day in and day out until it drives me to the point of insanity. Hence, why we took our time. It took almost 5 hours to get it done but it’s so worth it. At least that’s what i’m telling myself. And we ended Sunday off with a bang – throwing the bestie/ ex-neighbor a le-chic baby shower. And when your bestie is a lifestyle blogger, she insists on making her own decorations! So the banner, the large tissue flowers, all made by Pennies for a Fortune. AND we served this dip at the shower and let me tell you, it was a BIG hit. Seriously, if you haven’t tried it yet, what are you waiting for? It’s addicting. 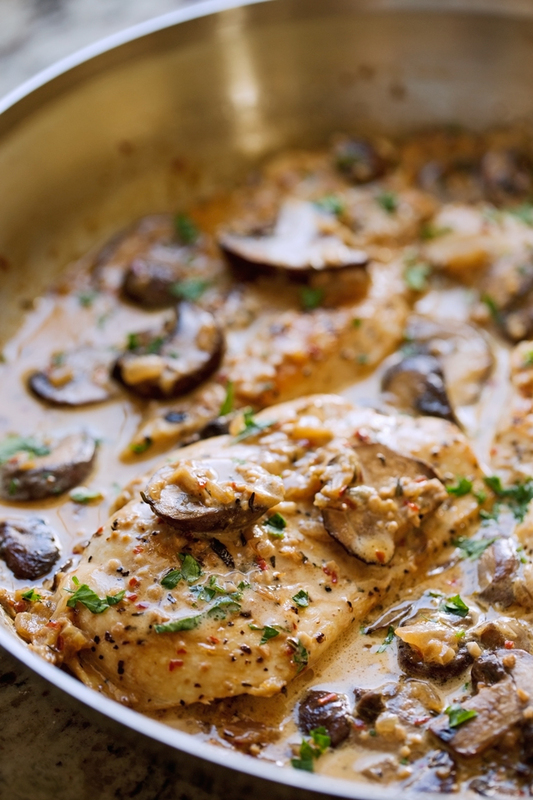 And now back to my garlic and mushroom one skillet chicken in cream sauce. Instead of starting off with the chicken breasts, this time we’re sautéing off some mushrooms, letting them sweat up a bit in a little olive oil before the chicken gets it’s turn. We’re still using simple ingredients like butter, garlic, red pepper flakes, thyme, and mushrooms. It’s all pantry/refrigerator staples, folks. No need to run to the store. I used shallots in this recipe but if you don’t have any on hand, feel free to use red onions instead. What really makes this chicken dinner next level stuff is the chicken broth simmered with shallots and a big splash of heavy cream at the the end. 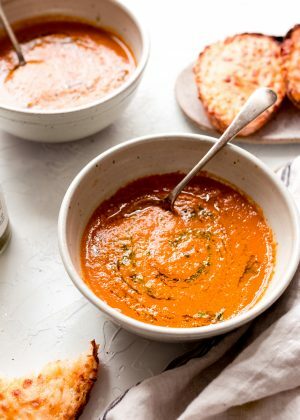 The sauce is creamy and luxurious and is perfect to toss with some angel hair pasta! You can double the ingredients for the sauce and drizzle it on pasta or veggies. I served it up twice. Once with asparagus and the second time with pasta and with each time, I loved this garlicky mushroom chicken dinner a little more. Next time, i’m serving up crusty bread with this chicken so that I can mop up all the creamy garlicky sauce. 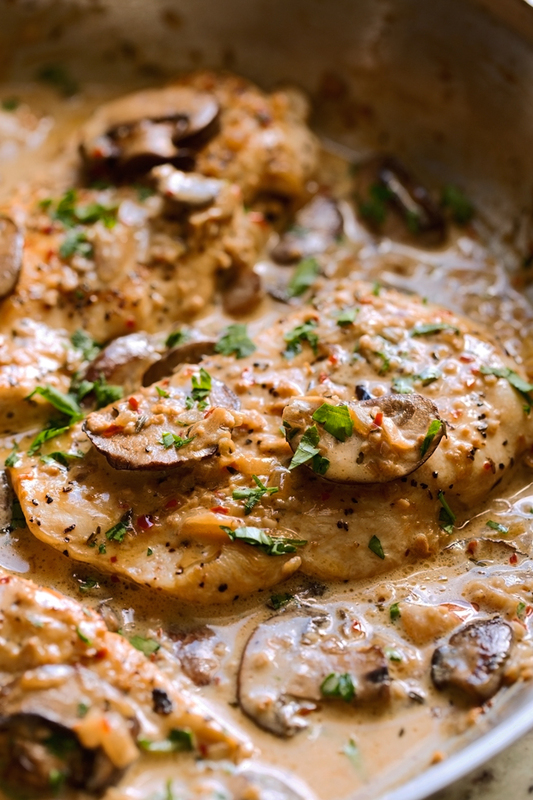 Just like my other one skillet chicken dinners, you can used chicken breast of boneless skinless chicken thighs for this recipe. Just make sure to pound the chicken down to the same thickness (between ½-¾ inch thick). I browned each side of the chicken for a couple of minutes. The chicken won’t be cooked all the way though but don’t worry, we’re going to finish the sauce and the chicken off in the oven before serving. Here’s to a new year and eating more one skillet chicken dinners with veggies covered with garlicky cream sauce! ???????????????? In a 2 cup measuring cup or a small bowl, combine the chicken broth, minced garlic, red pepper flakes, and dried thyme. Heat 1 tablespoon of the olive oil in an oven-safe skillet over medium high heat. Add the mushrooms and allow to brown for 3-4 minutes stirring as required to brown both sides. 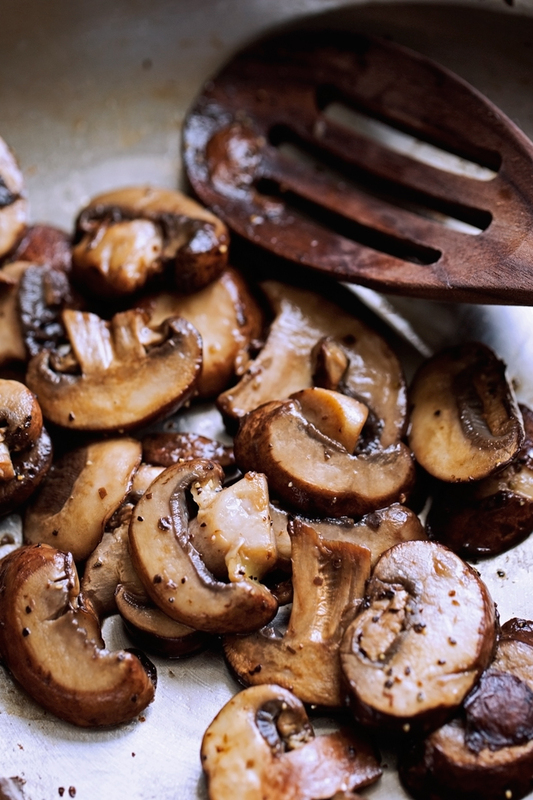 Remove the mushrooms to a plate (use one large enough to remove chicken as well). Heat the remaining 1 tablespoon of oil on medium high heat. Add the chicken and allow to brown on both sides for 2-3 minutes per side. Don’t worry if the chicken isn’t cooked completely, we’ll finish it in the oven. Remove the chicken to plate. Reduce the flame to medium, add the shallots to the skillet along with the chicken broth mixture. Using a whisk, scrape the bottom of the pan so all the brown bits are loosened. Let sauce simmer and reduce for about 8-10 minutes or until about ⅓ cup of the sauce remains. <– if you do not do this step, your sauce will NOT thicken. When the sauce has thickened, remove from the flame, add the butter and whisk until it melts completely. With the skillet off the flame add the heavy cream and mushrooms, and whisk to combine. Place the skillet back over the flame for just 30 seconds, do not allow the sauce to boil. Remove from heat, add the chicken back into the pan and drizzle the sauce over the chicken. Place the skillet in the oven for 5-8 minutes or until the chicken is completely cooked through. Top with chopped parsley or basil and serve warm. *Please note: the nutritional facts calculated are an estimate based on the ingredients i’ve used. If you’d like a more accurate count, please calculate them using the ingredients/brands you’ve used to prepare the recipe. 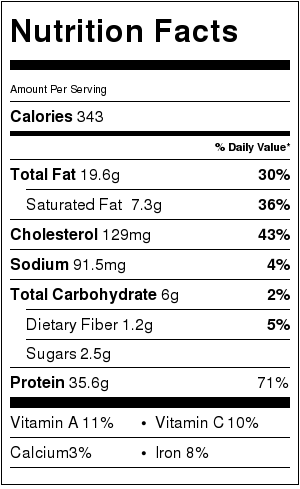 The nutritional facts provided is for ¼ of the recipe. 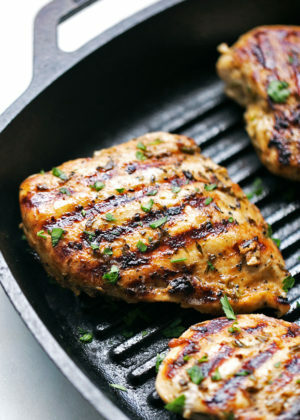 Has anyone tried this recipe with pork chops instead of chicken?? If you’re like me….while you’re making the recipe you may be thinking…where’s the salt?? Well you’d be right in thinking that. I made it as written and the only thing missing was salt. 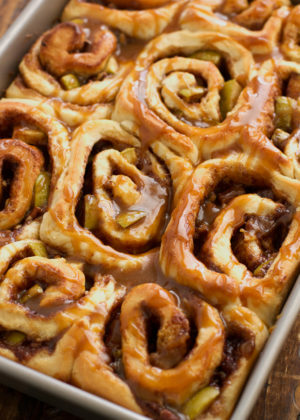 Next time I make this….and there will be a next time….I’ll salt and pepper the chicken before browning. I made this a few nights ago and it was delicious. My husband is more of a meat and potatoes kind of guy and he loved it as well. I just had some of the leftovers for dinner tonight and it was still delicious. I might increase the sauce amounts by 50% because there wasn’t a lot of sauce for the leftovers and I might decrease the red pepper flakes a bit ( I had crushed red pepper so that might have made it a little hotter). 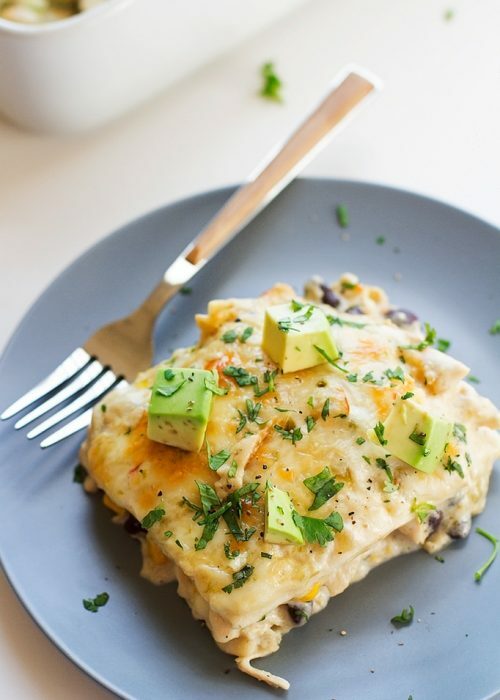 I will definitely add this to my go to menus for a quick and easy dinner, although I just happened to have heavy cream on hand. I made this for my family last night. Superb! 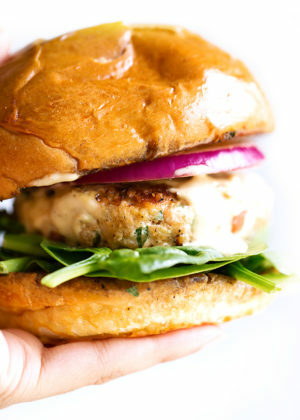 I made this recipe tonight — and it was delicious! I’ve bookmarked it and will definitely make it again, with extra sauce. I made this a couple of weeks ago. Today is my husbands birthday and he requested it for tonight. So delicious. Thanks for the recipe! Very tasty, but too spicy for my husband and I. I would 1/2 the amount of Red Pepper Flakes, perhaps even lessen by 3/4 the amount. 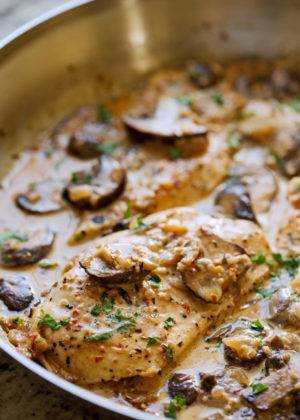 Other than that …… a very good saucy skillet chicken recipe. This was really good! Although it did take longer to make than the recipe calls for. I cooked the whole thing in the skillet, didn’t use the oven. Turned out great. I also added parmesan cheese at the end after I added the cream (which I doubled). Really kicked up the flavor and it helped thicken the sauce a bit more! Highly recommend! This was amazing and I will also be adding this to my regular menu. I love sauce and so I think I will double the sauce for next time. I had it with spaghetti noodles and it was so good! Nice recipe. But how long should the chicken be in the oven. I have see step 7 but I can’t se how long it should be in the oven. Awesome. Whole family locked their plates! Wow. Do I have to pound the chicken out? I don’t have a mallet, so is there any other option? I cut my chicken in 1/2 (slice it thinner ) and it worked great. AMAZING!! The chicken comes out perfectly juicy and the sauce has a nice spicy bite to it. Will be making again!!! Loved this recipe, after making it twice decided to make a vegetarian version for my daughter. Used veggie broth and portabella mushrooms instead of the chicken and added roasted red peppers. Delicious. My husband LOVED it. It was super flavorful, easy and honestly turned out restaurant quality. Made my house smell good too. Will be making this on the regular. Adding this to our rotation! This dish was absolutely delicious- there wasn’t a single bite left! I followed the recipe to the T except I had to transfer it to a casserole dish for the last step (my skillet isn’t oven-safe). The flavors are wonderful and the recipe was easy to follow. This recipe was so delicious!!! One of my favorite things about it was how different it was to all the standard meals I normally cook. I wanted pasta with this meal so I did make pasta to accompany it. I wanted sauce for the pasta so I followed the recipe exactly and had an extra pan on the side for additional sauce. I read in the comments above that some doubled the sauce recipe in the chicken but it came out runny. So I just used the broth, red peppers and thyme and followed the directions after that ; later adding butter and cream. I used a cast iron skillet for the recipe with the chicken. Also clarifying further comments about the broth not thickening, it thickened perfectly with my cast iron skillet, and then my other sauce round with the pan didn’t thicken as easily, just food for thought for others there. Recipe was delicious and I will be making it so soon again! We loved the dish. I used chicken thighs instead of breast and I cooked the dish with mashed potatoes. Just say no leftovers. I made this tonight and loved it. I served it over DeBolo organic linguine and it was delicious. Not real saucy but the it flavored the pasta just right for me as I am not one that wants my pasta drowned in a rich sauce. This is definitely a keeper! Fantastic dish. I also appreciate your listing the fat and caloric content. Went to follow you ion Twitter but I guess you don’t do that anymore. Anyway, thanks for staple dish. This turned out really great! I doubled the sauce amount so it was a bit runny. However, I threw in cooked gnocchi and it thickened the sauce right up. Literally, it looked like i planned for it and was a perfect one pan meal! I also cooked it on the stove. It was a great meal and thanks for sharing. Do you really mean to reduce it to 1/3 CUP? Or maybe you mean reduce by 1/3? I made this and it took a looooooooong time to reduce even a little. 1/3 cup wouldn’t be a lot of sauce for all that chicken, would it? No one else has made this comment so I must be wrong! That’s correct – you would reduce it to 1/3 cup. Everyone’s stove is different, so if it’s taking reallllly long to reduce, you can kick the heat up to high but just keep a close eye on it so the sauce doesn’t evaporate completely. You’ll also be adding cream (which won’t reduce) so there should be plenty of sauce for the chicken. However, if you wanted to serve the sauce with pasta or something, you can easily double the ingredients (for the sauce only) and reduce the broth to 2/3 cup. That should give you plenty of sauce for drizzling! I’m in the same boat. Definitely had to do more of a boil than simmer or it would take far longer to reduce. I made this on Sunday, had it for leftovers on Monday and here it is Thursday and making it again as I could not stop thinking about it on Tuesday and Wednesday. Crazy easy for how yummy this is. Thank you so much. Definitely a keeper. Lovely meal and so simple. My wife and i loved it. I made this today for Lunch! Yes, lunch. 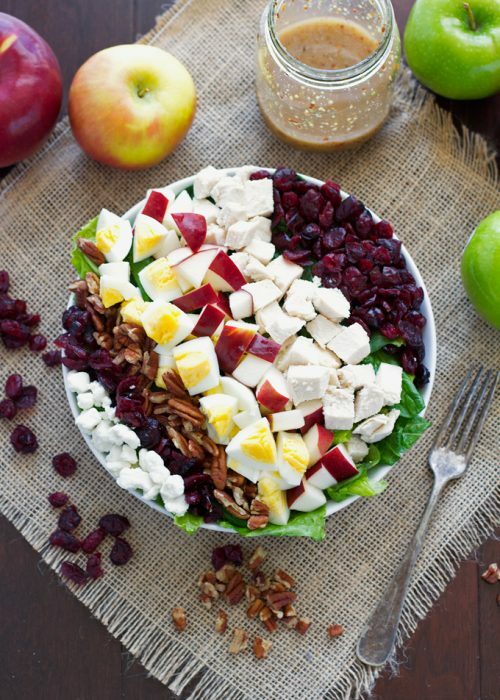 We’re trying to eat our bigger meals early in the day and lighten it up for dinner. I didn’t read the directions thoroughly before beginning and started out in a pan that could not be used in the oven…so I made the whole dish on the stove top! I just let my chicken breaths simmer covered until done on the inside. Still turned out great! Next time I will add way more mushrooms! They were so good in the creamy sauce! I used light whipping cream and added a little flour to make my sauce thicker. I saw where another reader added spinach….will try that next time as well. We enjoyed this and I believe it would be very easy to expand it to make for a small dinner party. I served it over brown rice with a side of steamed broccoli. All yummy. It’s a keeper! 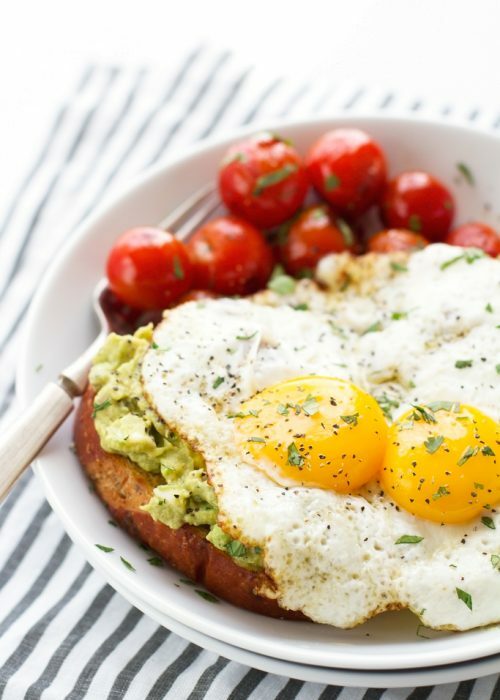 This is so easy and delicious. I used chicken thighs, and Shitake mushrooms instead of Baby Belo mushrooms. The seasoning really came together for a little change of pace chicken dinner. This is a FANTASTIC recipe and compnay-worthy! 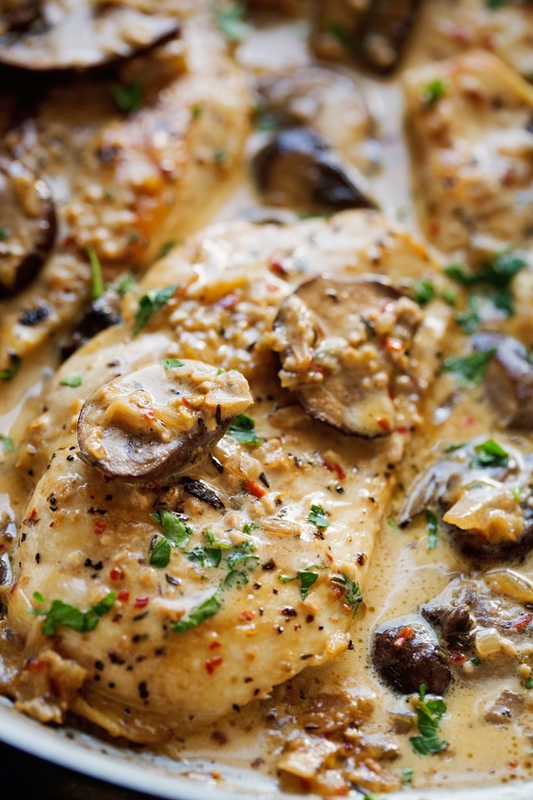 I’ve been searching and trying a LOT of chicken-mushroom recipes; this is not only a keeper but will be my go to. EXCELLENT! Wow, this was delicious! I made a few changes to work with what I had on hand. I always keep a bag of Perdue chicken tenderloins in the freezer and used few pcs for 2 servings. I didn’t have heavy cream, so I used about 1/2 cup of neufactchel cheese with 3/4 cup half & half and a couple of handfuls of baby spinach. I used ribbons of fresh basil at the end with white pepper, I made egg noodles for him and quinoa for me. We were both impressed -YUM! Made this tonight. It was delicious. Whole family loved it. Didnt have heavy cream or fresh parsley or basil so I used half and half and dried basil which worked fine but of course sauce was not as thick. Tasted good though and worked in a pinch. I didn’t have an ovenproof skillet, so after I put the chicken back in I left it on the stove for about 10 minutes on medium heat to warm the chicken through and finish thickening the sauce (which I doubled) while stirring constantly. Served it over fettuccine and it was perfection! Put I on spin on it. Great recipe! This was a great recipe, loved the garlic combined with the.shallots in a creamy mushroom sauce ????!! I can’t wait for leftovers tommorows, the only reason I gave it 4 instead of t stars is I didn’t like the thyme…. I make this at least once a month! I have a picky child who actually loves this recipe! I’ve had it with rice, risotto, pasta and potatoes. This was such a nice change, easy to make. 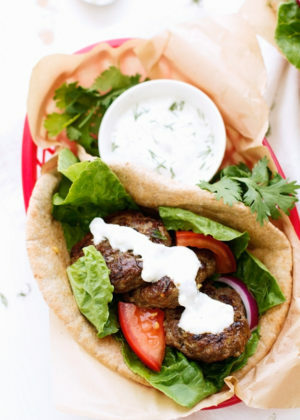 I substituted sweet white onion & used Greek yogurt with cornstarch in place of heavy cream, DELISH!! As a man, i love to try new recipe selections based on what my wife might like. She works later than i do, so i wanted to try this.ans have it ready. I went grocery store. Heavy whipping cream, and some fresh chicken breasts. I had the rest……or so i thought. I was completely out of Thyme. I used Italian Seasoning, which does have Thyme in it, as well as Basil, Marjoram, Rosemary, Savory, and Oregano. So it also got a couple of servings of long uncut Green beens that are cooking with it. Its in oven now, and its an awesome aroma. I love the garlicky part! I will try to upload a photo to the Instagram addy. How about using coconut milk instead of heavy cream for reducing fat and calories as Avery healthy one?! Hi Lily! Do let me know if you decide to give it a try with the coconut milk. I’ve only tested the recipe as written so not really sure how the flavors would mesh with coconut milk. I’ve used coconut milk every time I make it, because I can’t do cream! It tastes great! Be sure to use extra thick coconut milk, or coconut cream. This didn’t taste bad, but my sauce never thickened up so it was just a puddle at the bottom of the bowl. Winner winner. Chicken dinner it smells so great I made it tonight I’m waiting to take it out of the oven. I wounder how it would be with a nice boneless strip steak . Hi Lois, this recipe has only been tested with the cream so i’m not really sure whether cream of mushroom soup would be a good substitute. For best results, I suggest following the recipe exactly as written. This is delicious! I serve it with creamy risotto and asparagus. Excellent. We used b/s thighs and it was great. My only mistake is in doubling the recipe to 8 thighs, I doubled the sauce as well, so it did not reduce as much or thicken completely (over 20 minutes and still had about a cup). Good side is the extra sauce was great with wide noodles. I want to serve this to 8. I have no problem doubling the recipe but could I make the whole dish ahead of time and reheating in a slow over? Hi Ann. Yes, I think that would be fine. The sauce does thicken significantly as it sits so you may need additional water/broth to thin it slightly before reheating. What praise for such a great make ahead dish. You were correct, the sauce did thicken a bit more and I did thin just a touch with broth. This is really a sumptuous dish. 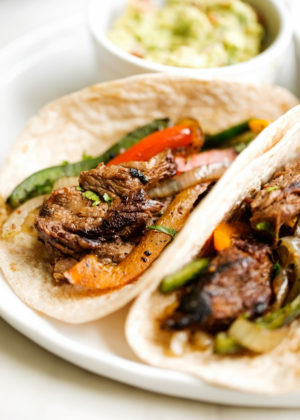 Served with only hot crusty, rustic bread and asparagus. Yum! Can I use chicken stock cubes rather than broth? Sure, i’d just prepare the broth with the cubes before adding it all into the skillet. Omg. This recipe is AMAZING. I’m not a big fan of mushrooms, but I couldn’t get enough of em in this. Just do yourself a favor & make double the sauce. This is gong to become a regular in my rotation; loved it! Made this last night for the family and it was a huge hit! It was amazing! Even my really picky son ate it and said it was awesome! 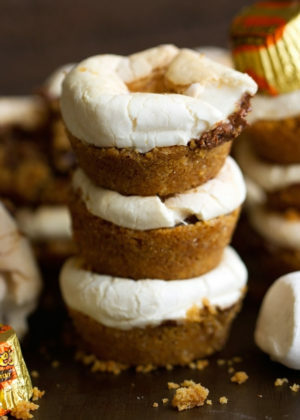 Oh my goodness, this recipe is heavenly! I think I’ll also try this with slicked pork loin sometime! 1- I used a medium white onion instead of scallion. 2- I cooked half the onion with the mushrooms, cooked the other half with the chicken. 3- I generously seasoned the chicken with salt and pepper before cooking. I also just cut the chicken breast in half- did not pound it. 4- I doubled the sauce and added a couple handfuls of egg noodles to the sauce as soon as I started simmering the sauce, allowing them to cook together. 5- Used parley instead of thyme. 6- it did take a good 30+ min. for the sauce to thicken to the directed consistency, but it was worth the wait. Overall- my chicken hating boyfriend asked if he could take the leftovers to work the next day- I’d say this recipe is a major win! What can I substitute for heavy milk? Or can I leave it out? Hi Judy, I’ve never tried the recipe without the heavy cream, so not too sure on how it would taste without it. 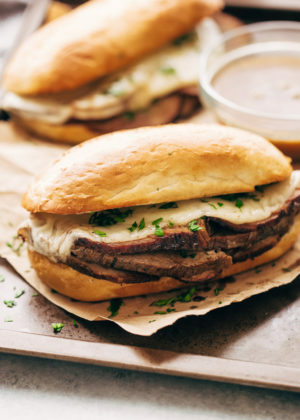 You could try substituting half and half if you’d like, anything lighter than half and half won’t allow the sauce to thicken and leaving the dish lacking a bit in flavor. This one’s a winner just tried it. Though I did brine my breast for four hours only difference. Came out moist and delicious! Great recipe! I made it tonight with chicken thighs, although I think the breasts would have been better. I think this would qualify as a “keto diet” recipe. Absolutely amazing chicken! The only change I made was using fresh thyme because I had some in the fridge. Thank you for such an awesome recipe! Really excited to try this recipe out tonight! I was prepping and reading over the details, but for the life of me cannot make out where the shallots come in to play. Think I may be reading over it. Any insight, anyone? Thank you! What could I substitute for the thyme? You can use chopped tarragon instead or simply just omit the thyme from the recipe. Hi, are red pepper flakes, red chilli flakes? This was wonderful and even satisfied my super-critical father (who cooks nothing but critiques like he’s on Top Chef!). I couldn’t find fresh button mushrooms and didn’t want to use canned, so I used sliced white mushrooms along with boneless, skinless thighs (5) and it came out wonderfully. Thanks so much, Marzia! I’ve got your wonderful-smelling minestrone going in my slow cooker right now and can’t wait to try it as well. So the broth never thickened and it never did after adding the cream. It ended up being chicken with milk sauce. Did I miss something? Can I use 2% milk instead of the heavy cream because I dont want to run to the store? Unfortunately I don’t think 2% is a suitable choice for this recipe. You run the risk of the milk curdling because of the low fat content with the other flavors in the sauce. Also, the sauce will severely lack that ‘creaminess’ that this dish needs. Marzia, the best thing about this recipe is that you listed the nutritional value!! Bravo for you and shame on all the other bloggers who fill us with unhealthy, fatty foods. I thank you and my two college boys thank you. They loved it. And they count every calorie daily that they put in to their bodies. Thank you again, Ron in Dallas. I made this for dinner last night. I paired it with some skillet potatoes & green beans. The only thing missing was some bread to soak up that sauce. You were so right, that sauce is killer! Thanks for a delicious recipe!! 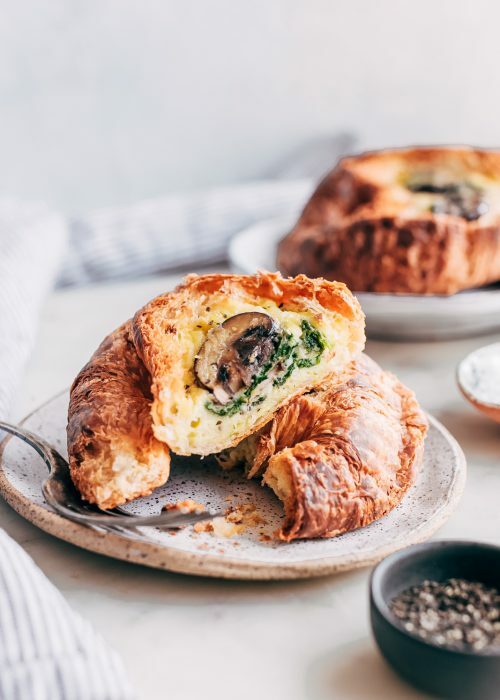 Just letting you know I am featuring this today in my weekly Low-Carb Recipe Love on Fridays post, and I bet it’s going to be a big hit with my readers. Sounds amazing. how much would cooking time change with bone-in thighs? that’s all i have, and I really don’t want to run out to the store again! You’re looking at about 15-25 minutes worth of skillet time + 10 minutes in the oven with the sauce. This is an estimate and actual cooking time may vary as the recipe has only been tested with boneless skinless chicken breasts. 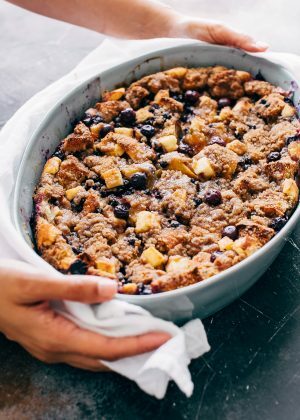 I don’t have an oven safe skillet, can I cook it on the stove then transfer it to some bakeware I have? Yup, that’ll work. Just allow your baking dish (empty) to heat in the oven as the oven preheats, then transfer from skillet and bake. This will then provide similar results to if you had used the hot skillet directly. Good luck! It’s in the oven now. I tasted the sauce and it was yummy. My kitchen smells heavenly, lots of garlic and thyme. I’m so mad I didn’t have bread!!! can you use coconut milk in place of heavy cream? In a word…no. You won’t get the creamy texture in the sauce and the flavor profile doesn’t sound like it will all work together with coconut milk. If you tried it and liked it, please share! This was a huge hit in our house! Absolutely delicious! This recipe is not suitable for a crock pot. Marzia, this is so up my alley! Really delicious! I made it today for lunch and after was instructed not to change anything and make it next week again! 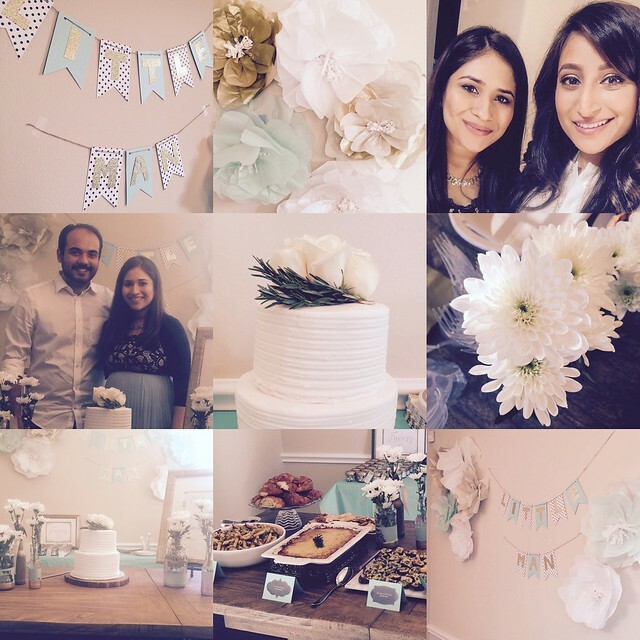 love the collage from the baby shower!! 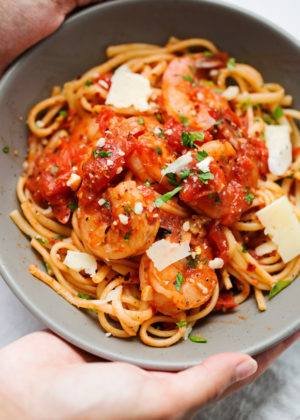 If I am wanting to make with pasta, do I make the double sauce at the same time and keep half out of the oven to poor over noodles, or put all the sauce in the oven and drizzle over noodles later, or put the noodles in the oven too? Sorry and hope that makes sense. I’d make a double batch of sauce together and then remove 1/2 before putting the chicken in the oven with the remaining sauce.